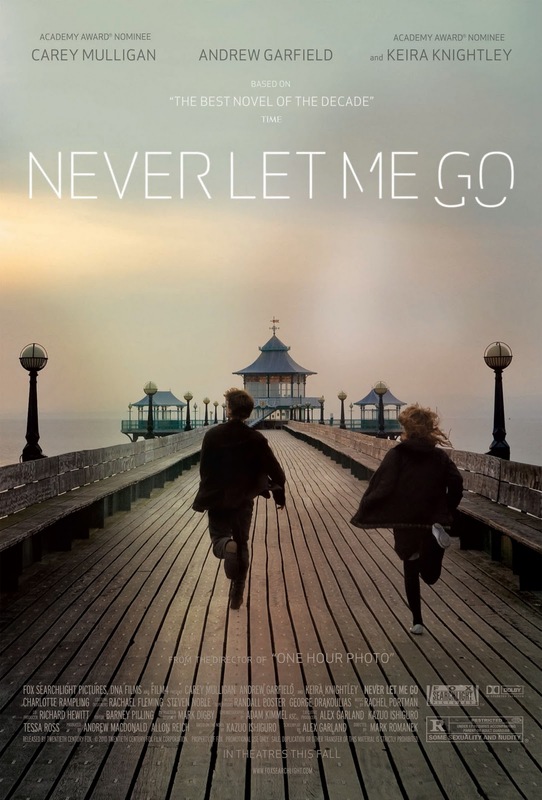 I watched the film ‘Never let me go’ at the weekend and was struck at how the characters quietly accept their fate and got quite frustrated that they never tried something bold to change their futures. But then I realized that most of the time we all accept our fate and it’s only at pivotal moments do we step out of designated paths and really shake things up. I suppose we do tend to get caught in a rut in life and accept our career or job or personal life, even settle for it. Then there are bigger things – living under a tough regime or a country in crisis, most people accept their way of life and only the few stand up to challenge it. Sometimes it’s to hard to change things when you’re just one person in a situation like that but on as smaller scale, in our own lives I think fear comes into play plus a lack of confidence. Sometimes we accept things because we don’t feel we deserve or can achieve anything else. For me the film was a reminder that we face these challenges all the time in different ways and we can choose to go quietly and stay on the same course or we can really strive to make our lives the best they can be, be the people we want to be and make that future our own. Whilst I sometimes think things are meant to be, I also believe that sitting back ad leaving it all to fate isn’t a good idea. We need to have more control over our lives and believe that we deserve happiness and contentment however long or tough the battle to get there is. I agree. Fate is a big part of things, but you can’t sit around and wait for it. You were given will power, abilities to take action, too. 🙂 The movie sounds interesting!!! I don’t really believe in fate as much as I believe that random things happen with a specific purpose of us learning something from them. I think that some things we of course cannot decide, for example the country we live in, our family and whether we get the possibility of an education handed to us on a silver platter. But we can carve out our own path, and control our outlook and dreams – although it can be really hard to leave the path we are on for something different and unknown. Aw thanks! I love your thoughts and I really hope things happen so we can learn from them! Hey, a thoughtful post. I agree we only go drastic when things are extreme, mostly. I recently changed jobs (literally a month ago) but for AAAAAGES was dying in the other one. I did have thoughts such as “Well, maybe this is all there is to it”, but I just couldn’t rest with it. I HAD to change. Hey, thanks for commenting! Well done for changing it up, really brave! I do believe that the path is there but we have to make choices which indicate which turn we will take. I think we are certainly meant to have particular people in our lives at pivotal times as well. I’ve never heard of this movie, sounds very interesting. I will check it out. Very true. I hope you enjoy it – it’s bleak but very though provoking and beautifully shot and acted. I do believe in fate, but we can’t expect it to do all the work for us. Hi Vix. Great post (as always). To a certain extent I do believe that we don’t have total control over our fates. That there is someone/something that leads us in the directions that we go in. I absolutely believe that it is our individual decisions that forge the small paths carved out amongst the big ones though. Although ‘everything may happen for a reason’, it’s up to us how to process and deal with things. I do also think that if anyone is unhappy with any aspect of their lives, that it is up to them to do what they can to change it and not just accept what is happening. My brian must do the same as I totally got what you meant and life is a pretty big circle most of the time too so I think we’re ok! I shook things up 10 years ago, and have never looked back. Fight your fate. I’ve reinvented myself time and time again ~ we move, we change, we grow . . . as long as we are unwilling to settle. That’s a great mindeset to have! I agree – much better to try for something rather than sit letting things happen to you! That’s a hard question. I think believing in fate and accepting it are two different things. Like you, I try to believe everything happens for a reason. But I do feel like we can’t sit still and just wait for things to happen. There’s that quote by Gandhi “Be the change you want to see in the world.” I find so much truth in that. We have to be the change to make change happen. I think you’re right and great quote thanks! Apart from stray moments, I don’t believe in fate. I believe in seizing what you have and trying to make it better. I wish everyone started with a pleasant “what you have,” but that, I suppose, is another matter altogether. That’s true we all have different starting points but I supoose we can all try to improve it if we have the will to do so.